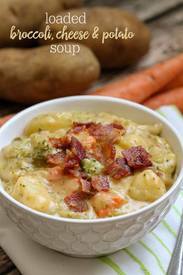 Bacon broccoli cheese & potato soup! This Potato Soup is loaded with flavor and has so many delicious ingredients including Bacon, cheese, potatoes and broccoli. Sure to be a hit at every home. Make it on a rainy day, or just because!